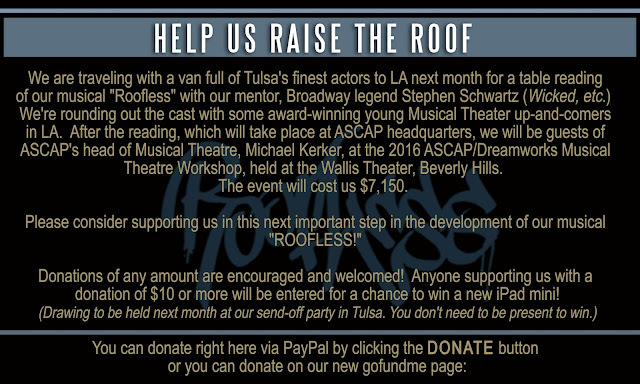 Here it is RoofFam, THE FIRST EXTENSIVE LOOK AT "ROOFLESS" LEAKED TO THE PUBLIC. Close your eyes and enter the world of the "Roofless!" This 15-min mash up includes audio from our rough demos that we've produced during the development process, from workshop recording sessions, and dialog from table readings (which explains the page-turning noises….hahaha.) Much of the vocal work on the 20 songs in the show has been recorded by us, the composers (Tim Long and Jerome Johnson, aka LoJoWerkz) as is the normal case for musicals in development. Occasionally we've had very talented performers step in to help us on some of the demos. You'll hear much of their work here. Names of performers, as well as scene/song names appear on-screen. This demo touches on only about 1/8 of the material in the show, but hopefully represents the "Roofless" flavor fully. Again… our main reason for releasing this development material is to help raise awareness of the show as part of our fundraising attempts for our upcoming LA trip where we'll take many of the performers heard here with us to perform the entire show for our mentor Stephen Schwartz, Michael Kerker of ASCAP and several other Industry folks who will critique the show & offer us their advice. So PLEASE, if you like what you hear and want to help us move the show to the next step, DONATE to our support drive. ANY AMOUNT IS GREATLY NEEDED AND EVEN MORE GREATLY APPRECIATED!! BIG SHOUT OUT to Bryant Lamar and 4U Media Group for recording the Avionce Hoyles sessions, and Tim Kennard and Quinton Davis, Forrest Productions for some amazing recording sessions in 05, some of which have remained as part of the score. 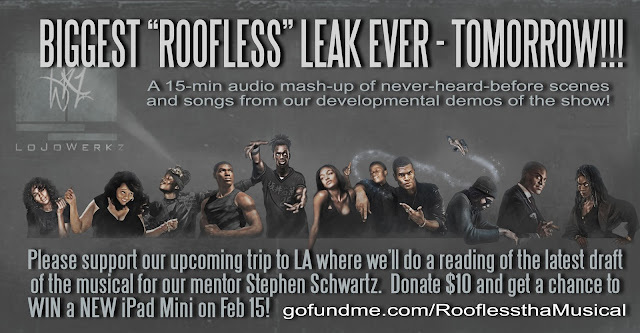 BIGGEST ROOFLESS LEAK EVER… TOMORROW, JAN 25! HEADED TO LA for a reading with STEPHEN SCHWARTZ! SUPPORT NEEDED!